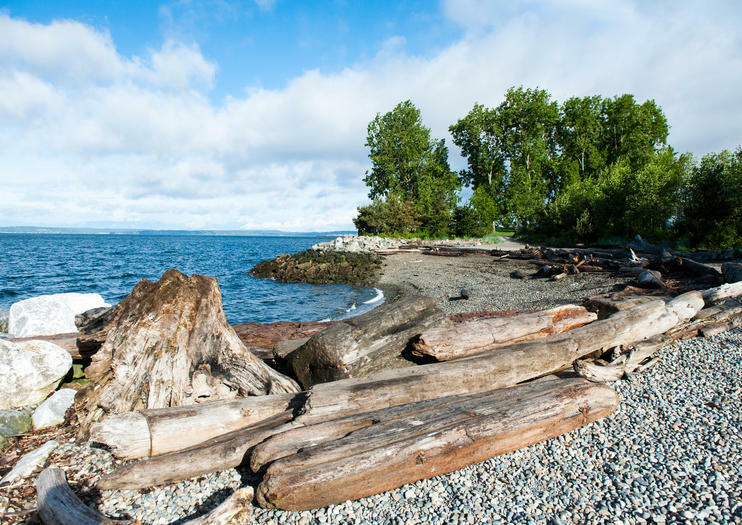 A prime Elliot Bay location gives Myrtle Edwards Park gorgeous views of the Olympic Mountains, Puget Sound, and Mount Rainier. This shoreline park is walking distance from top downtown attractions, and offers a paved trail for pedestrians and cyclists that spans the 4.8-acre (1.9 ha.) green space. The 1.25-mile (2-kilometer) trail through Myrtle Edwards park is all about views of sparkling water, rocky beaches, and even the occasional orca whale. On the south end of the park is the Seattle Art Museum’s Olympic Sculpture Park. To the north, the paved Elliot Bay Trail continues through Centennial Park and around the waterfront for 5 miles (8 kilometers). Visit the parks independently, or join a city sightseeing tour that stops nearby. Even on warm days in Seattle, there’s often a cool breeze on the waterfront, so bring layered clothing. Public restrooms are located in the pavilion of the Olympic Sculpture Park. The Elliot Bay Trail is paved and wheelchair accessible. Myrtle Edwards Park runs parallel to Elliot Avenue on Seattle’s waterfront, northwest of Pike Place Market. Several paid parking lots are available nearby, and the park is also easily accessible by bus, with stops near the entrance at Elliot Ave. and 3rd Ave. West, as well as the southern entrance by the Olympic Sculpture Park. With views across Elliot Bay to the San Juan Islands, the park is especially scenic at sunset, when warm light glints off the Olympic Mountains in the distance. While Myrtle Edwards Park is open 24 hours a day, the adjoining Olympic Sculpture Park opens 30 minutes before sunrise and closes 30 minutes after sunset. One of the best places in Seattle to watch 4th of July fireworks, Myrtle Edwards Park fills up early in the day with revelers toting lawn chairs and picnic blankets. Another favorite is Seattle Hempfest, a long-running summer festival that is held in the park and features a music stage, vendors, and work on display by local artists.